Global to Local’s leadership and community mobilization initiatives strive to improve health by building community power. 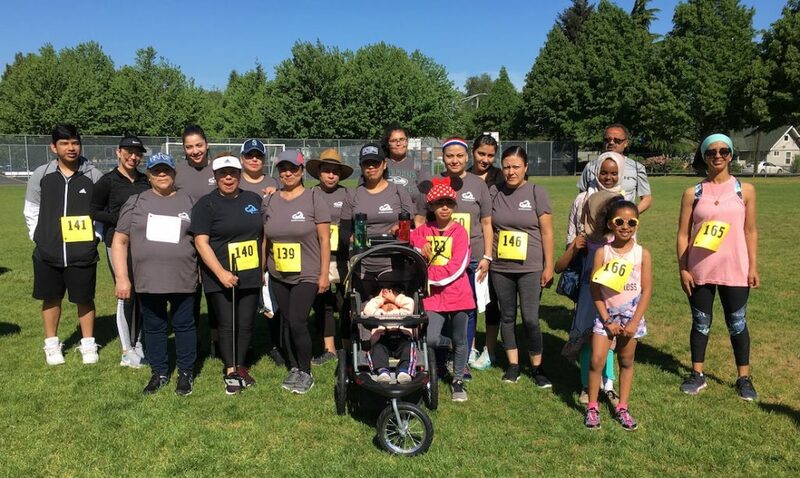 As part of this effort, our Community Connectors programs recruit and support individuals who serve as liaisons between their diverse communities and the cities of Tukwila and Burien. 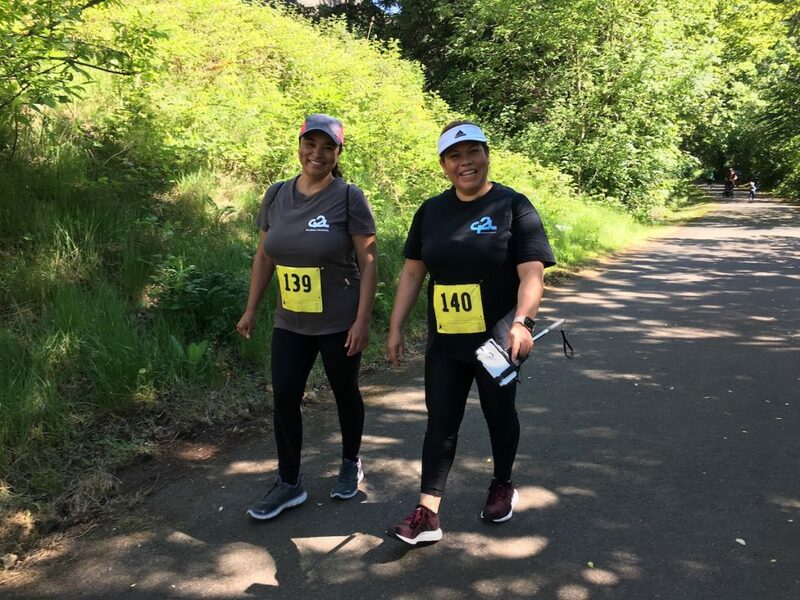 Earlier this year, our website featured Tukwila Connector Rinny Tun. 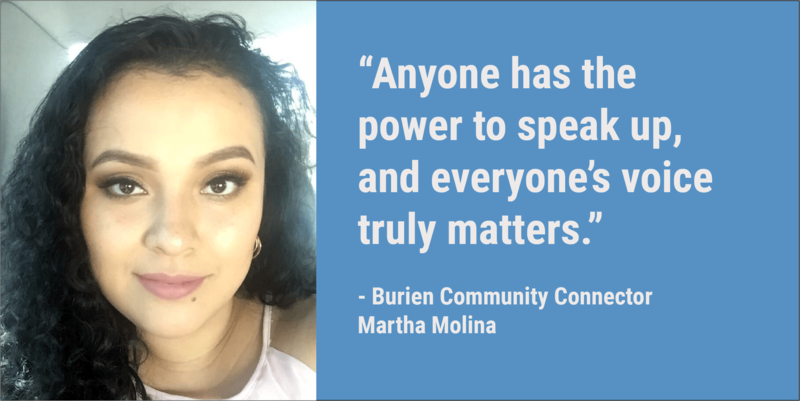 Now we are excited to spotlight Burien Connector Martha Molina. Read on for our Q&A with this community leader! How did you learn about the Community Connectors program? Why did you decide to join? My friend told me about it. I thought it was a great opportunity for me to learn more about local government and how to connect the community with the city. What are some of the most urgent or greatest needs you see in your community? The biggest needs I see are: getting more families involved in community events and meetings; regular child care for families who want to attend meetings but can’t because of children; and more languages offered for interpretation in meetings/events. What activities have you done as a Connector? I took a City 101 training, helped review and give out surveys, and learned about city resources and who to call for help. I attended a City of Burien budget meeting, and have done some outreach work by passing out fliers and by reaching out to friends and family through social media to share events and information. 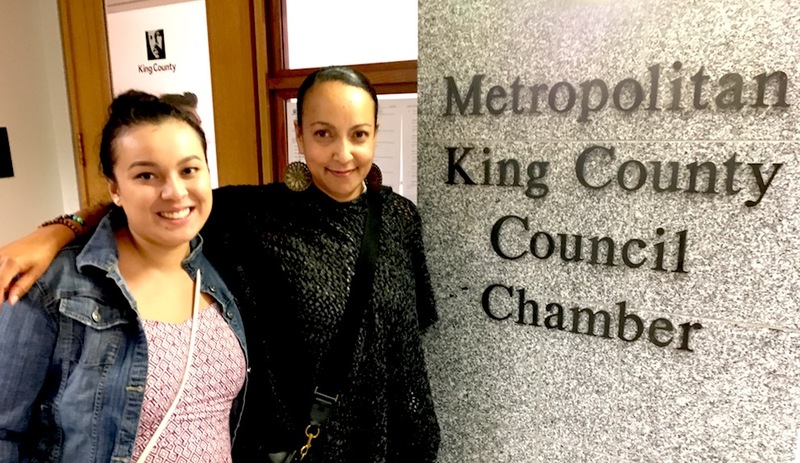 I also attended a King County Council meeting in Seattle, which I never had done, so that was exciting and different. What are some of the most important things you’ve learned as a Connector? The biggest thing I have learned is how powerful word of mouth can be. The Latinx community, especially older folks who don’t use social media as regularly, rely heavily on word of mouth from their close friends and family. I can’t begin to say how many times I’ve been told that someone learned of an event through a mom from school or through a next-door neighbor. Another important thing I have learned is that anyone has the power to speak up, and everyone’s voice truly matters, no matter how small or unimportant you feel. What’s something you’ve accomplished as a Connector that you feel proud of? I know there is still a lot for me to learn, but I am proud that I have introduced the idea of attending events and learning about city politics to some of my friends and family, and hope I have made them consider attending more often — because if I can, they can, too. I hope for a community that welcomes diversity and accepts differences. 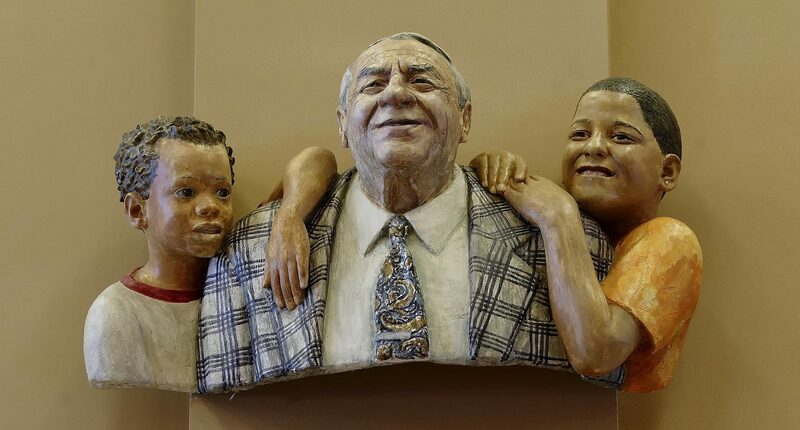 A community in which neighbors know each other and reach out to each other. They participate in events that impact them, and are able to understand the content in their language if it’s not English. An inclusive community that works together and listens to the needs of one another. Anyone feels safe to be a leader and has the support to get there. I’m so grateful for the support I have been given during my participation in the program. I know I can always reach out for questions or any other support, and don’t feel ashamed for asking too many questions. I know I am appreciated, and that feels so great. Gali eyed a green beverage with suspicion on a recent Friday afternoon. She’d never heard of putting spinach in a smoothie before, but she took a chance, tried a sip, and was delighted to discover a new favorite drink. Gali and her friends had concocted the smoothie at a summer class for youth held at Global to Local. 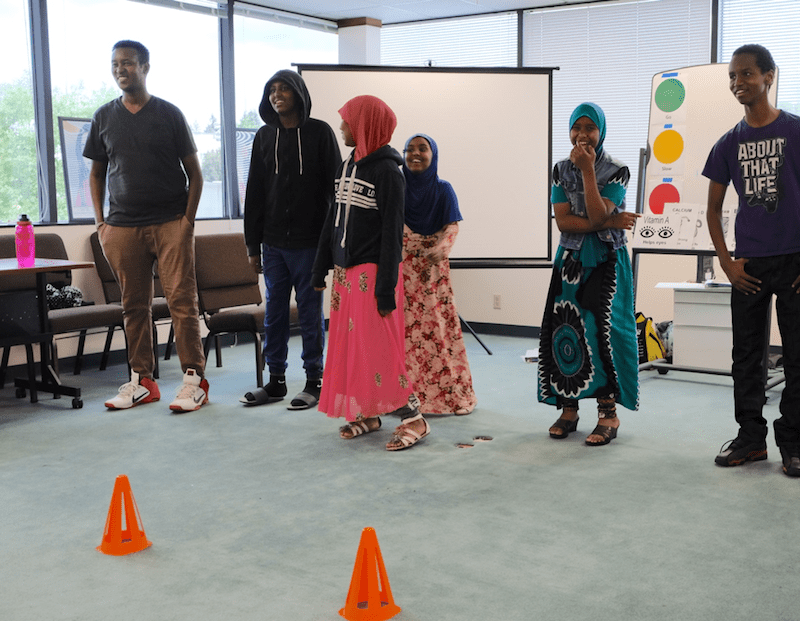 Young members of the local Somali community who joined the four-class series learned about nutrition, enjoyed physical activities, and developed their leadership skills. 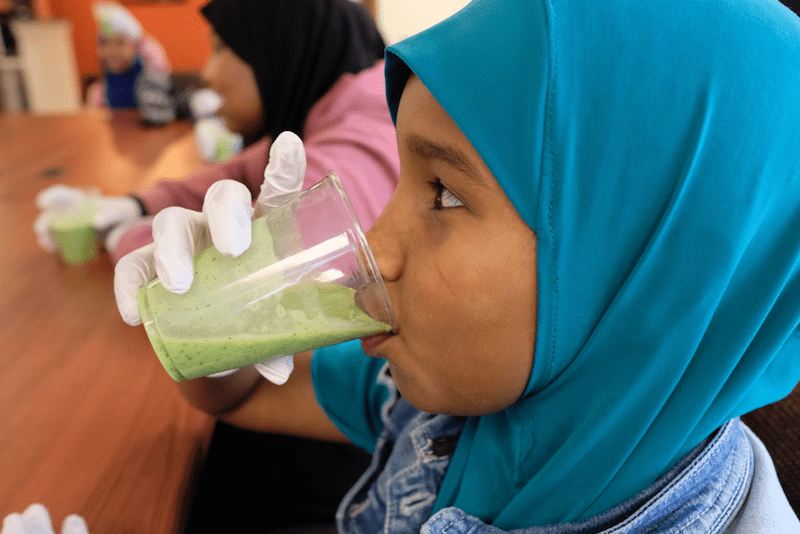 Nutrition class participants, including Hassan, concentrated hard to get their smoothie recipe just right! 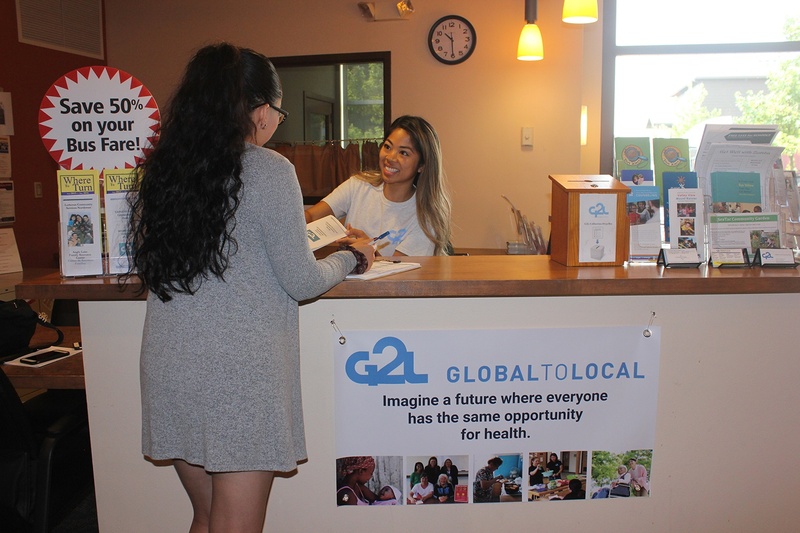 Global to Local offered the summer program in partnership with Food $ense to help local youth develop healthy habits. Educating young people about their health not only sets them up to make good choices for themselves, but also to positively influence their families. 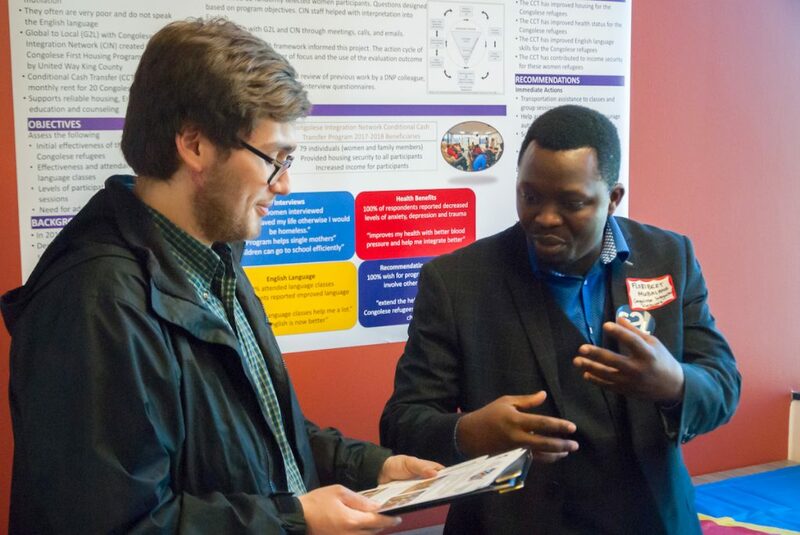 Community Health Worker (CHW) Abdi Hussein coordinated the class, one of many programs that Global to Local CHWs offer to help build a healthier community here in the SeaTac/Tukwila area. CHW activities range from organizing exercise and nutrition classes, to addressing barriers that prevent residents from visiting their primary care doctors. Community Health Worker Abdi Hussein (left) laughed along with students as they played a game to learn about the effects of caffeine. Our CHW work is inspired by the many global health programs that train trusted community members as health workers who operate outside of clinics to provide education, referrals, and social support for health behaviors. It’s just one of four initiatives that G2L has developed to improve community health. After school starts back up, Abdi will continue to keep in touch with the students and their families, who are his neighbors. Two of the students’ parents are joining a nutrition class that Abdi’s organizing in September. And he is working to connect the families with their primary care doctors. Through G2L’s partnership with HealthPoint, Abdi and other CHWs help families make medical appointments, communicate with clinicians, and follow through with prescriptions and doctor recommendations. Global to Local is also engaging young people through our Green Cities partnership with Forterra. We’re inviting youth to give input about where trees should be added in their community, and then get hands-on planting trees! By the way, we suspect there are more green smoothies in Gali’s future. A few days after that summer class, she called Abdi to tell him she’d made a batch for her whole family. An outdoor activity not only helped students burn some energy, but also taught them about teamwork as they raced the clock to make a star shape with a rope. 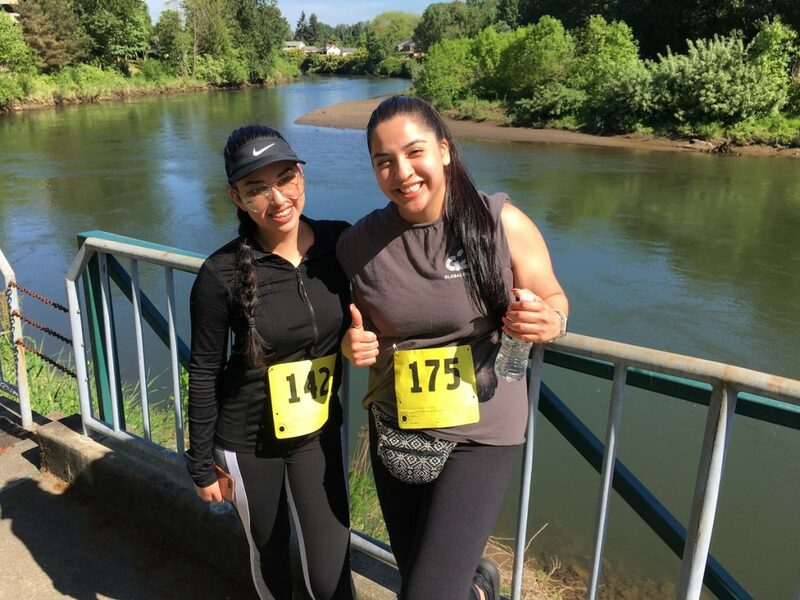 In a place as diverse as Tukwila, where over 80 languages are spoken, it’s not easy for the city to engage all of its residents—particularly communities who face language and cultural barriers. In 2013, the city began working with G2L and Forterra to create the Community Connectors Program to help boost civic engagement. Through this partnership, we recruit Community Connectors from groups that the city has a difficult time reaching through traditional outreach. 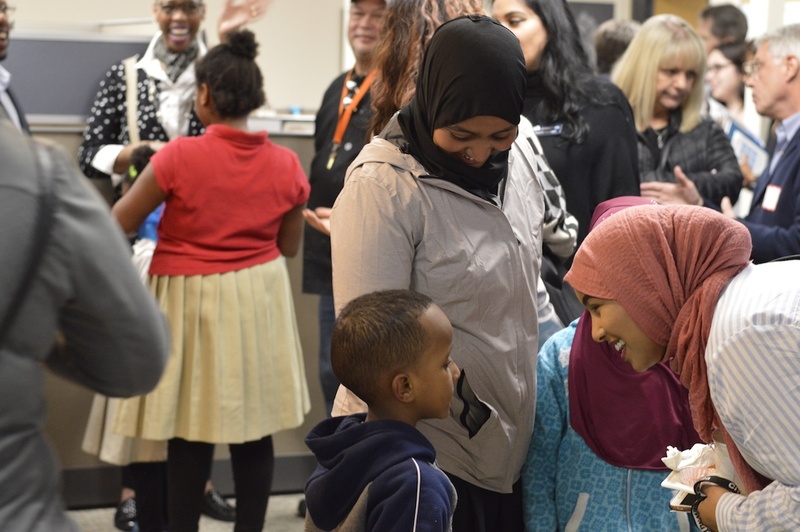 Tukwila Connectors include members of the African-American, Latino, Somali and Burmese communities who have deep connections in their communities, and who are committed to facilitating outreach and communications. Connectors join “City 101” trainings where they learn about things like how the city is structured, what different departments do, how the budget is developed, and what city council does. 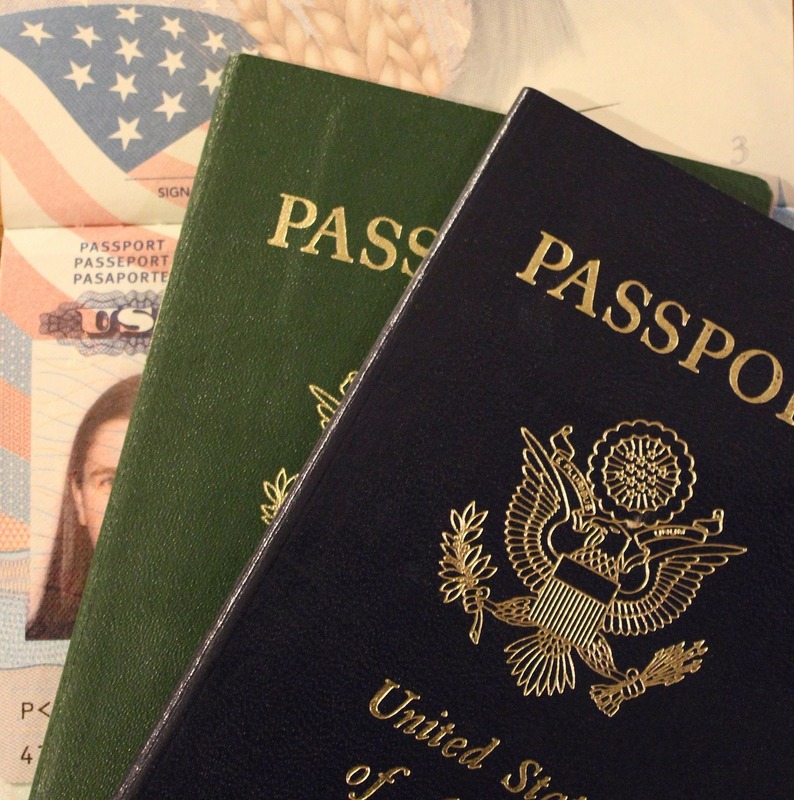 “Knowledge is power — especially for people who are new to the country. 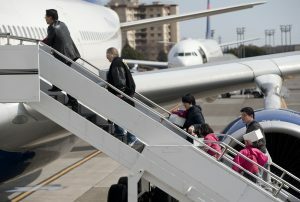 They need to know the processes,” said Leadership and Engagement Manager Niesha Brooks, who runs the Connectors program. Next, G2L and the city work together with the Connectors to identify priority projects that the Connectors can support, reaching out to their communities to seek input on things like the comprehensive plan, housing, safety, and economic development. Connectors also provide guidance to city staff on how to design and undertake comprehensive and effective outreach. These efforts ensure that the priorities of previously underrepresented groups are heard and incorporated into city work. 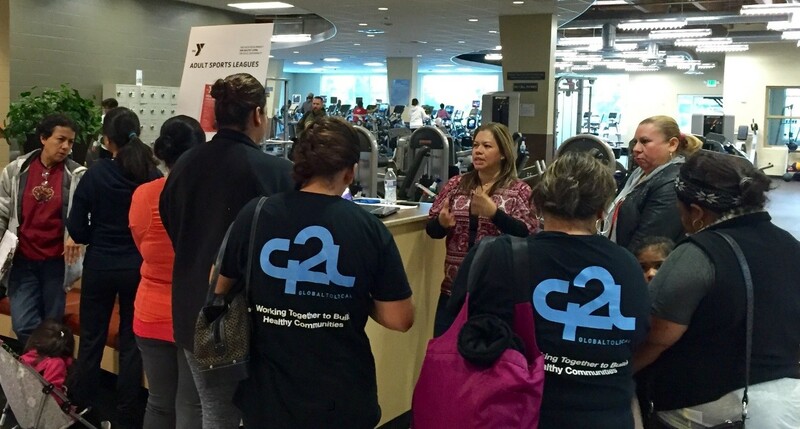 The Community Connectors program is key to G2L’s efforts to advance health equity in our region. We started our work in 2010 by asking community members to describe what a healthy community looks like to them. Many talked about feeling connected to their community, being able to access and navigate systems, and having a voice. “This program is letting the Connectors and community members know that their voices are valid,” said Niesha. 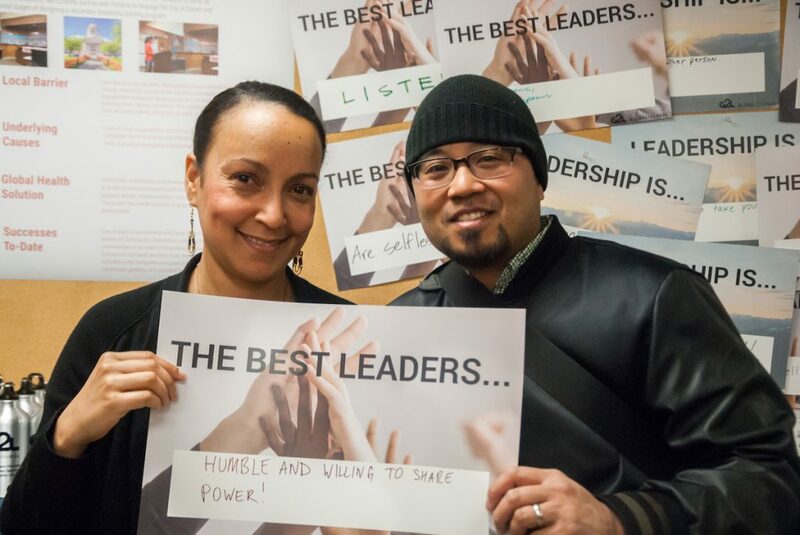 As the Connectors program builds community voice, it also invests in the capacity of individual leaders. 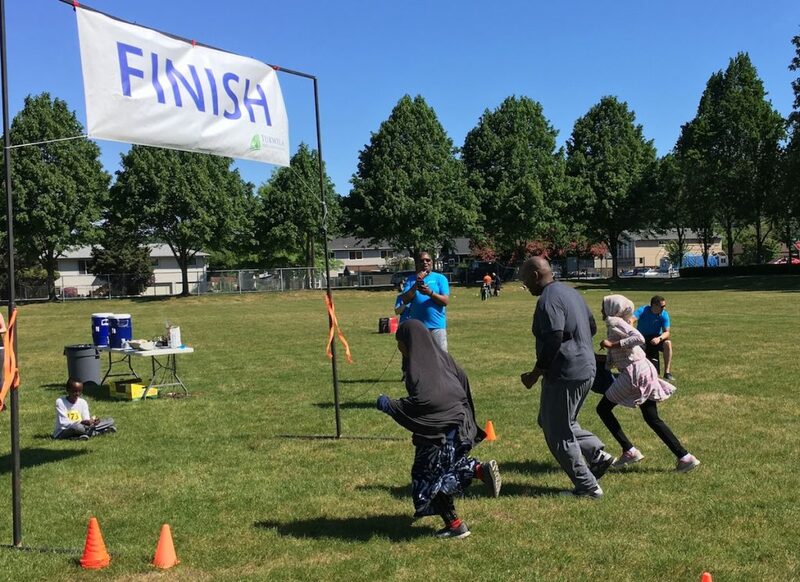 After pioneering Community Connectors in Tukwila, we partnered on a similar program with the City of Burien. 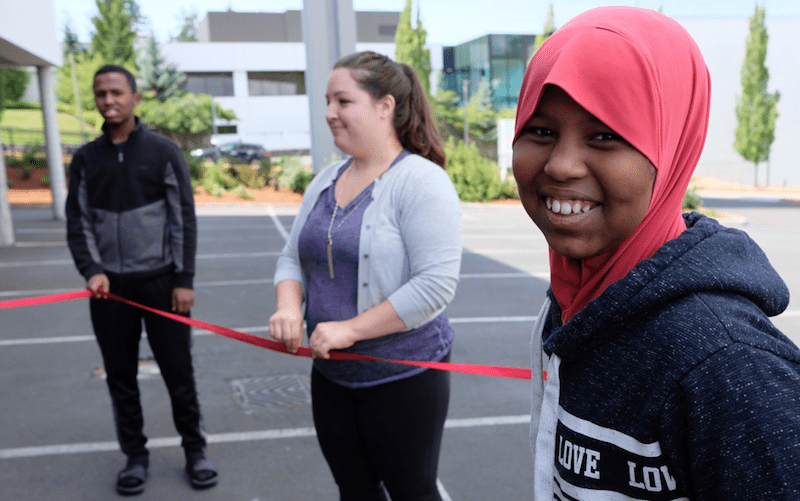 Cityvision Magazine recently highlighted Burien’s Connectors program in an article on the city’s efforts to better serve its residents. You can read “A Right to Be Heard” online; the article starts on page 16. 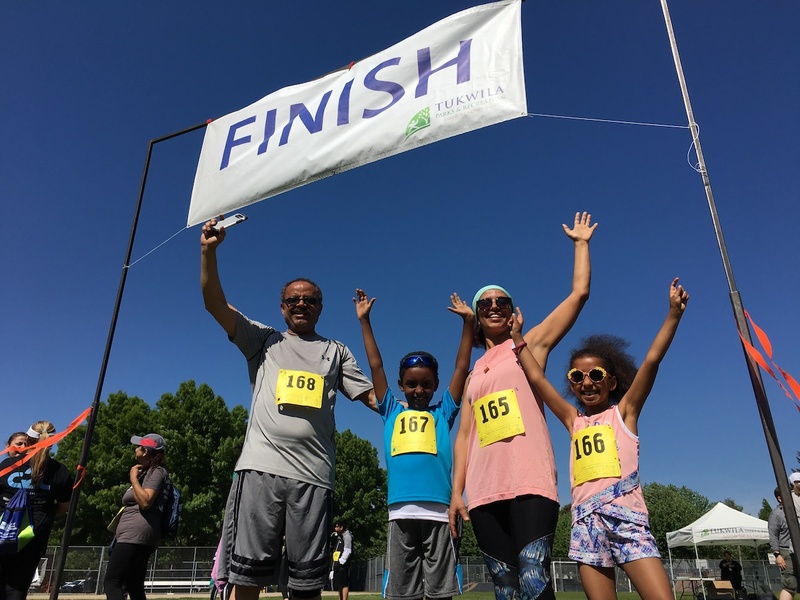 Read Community Connectors program descriptions on the Tukwila and Burien city websites. Keep visiting our website, where we’ll feature stories of Community Connectors. 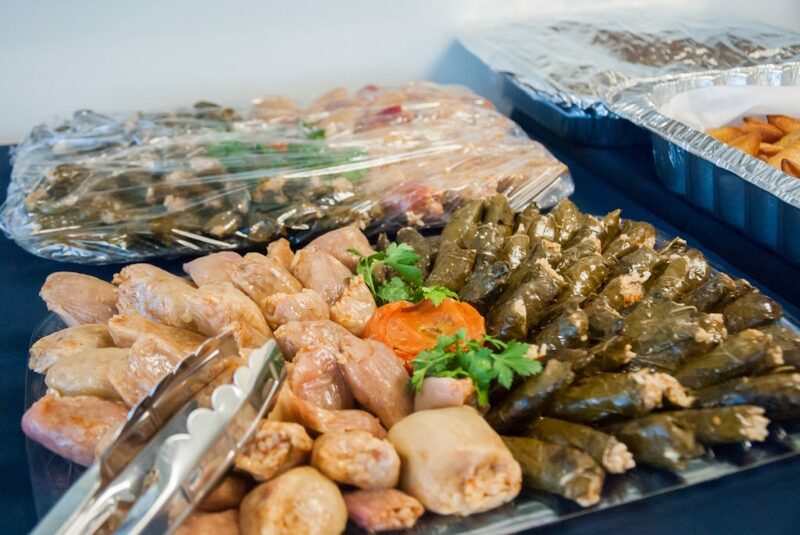 To receive updates about all things Global to Local, subscribe to our email newsletter.